England finally got the win they deserved after coming so close against the top two teams in the world. 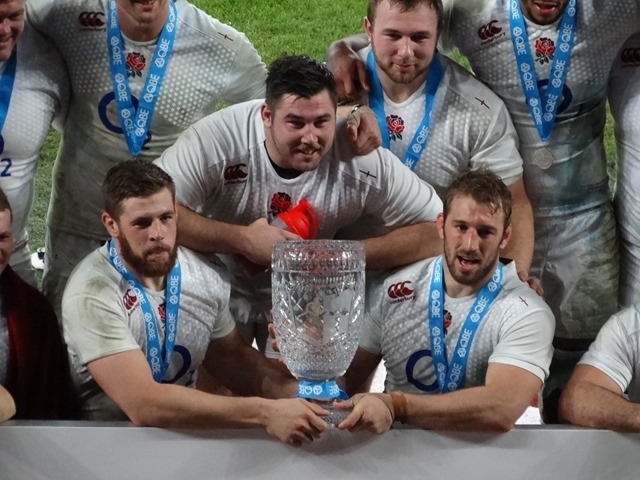 I thought that the press was far too hasty to judge the team as having gone backwards when they were missing so many key players, Corbisiero, Launchbury and Tuilagi to name just three, and I still believe that the likely finalists on 31 October 2015 will be England and New Zealand. The game was a good end of a busy week of rugby related activities for me too which had meant taking a few days off from work. It started on Tuesday afternoon with a meeting at Leicester Tigers of the Regional RWC Legacy group where amongst other subjects initial thoughts for the Trophy Tour were discussed. We were also told of a ‘Festival of Rugby’ which will run from mid-June to end of August to celebrate the game in all its forms; details will be sent to everyone in due course. The next day saw me at Grange Road for the annual Cambridge University vs Steele-Bodger’s XV fixture, traditionally the last game for the Light Blues before the Varsity Match. All the great and the good of local and national were there including Mickey Steele-Bodger himself, former RFU President Brian Williams (as well as the current President), Mike Dimambro from Cambridge Referees, Richard Duckett from Eastern Counties Schools and Nigel Brown who is now the University’s U21 coach. I was honoured to be briefly introduced to Owen Chadwick who is the oldest surviving Cambridge Rugby Blue and the oldest surviving British Lion. The Steele-Bodger’s XV was captained by James Shanahan, formerly of North Walsham, Cambridge and Old Albanians, now head coach at Plymouth Albion and England Counties backs coach. The 26-16 victory was chiefly due to the way Shanners ran the show from fly-half showing that experience can still overcome youthful exuberance. Click here for pictures. From Cambridge it was straight to Twickenham as I had a breakfast meeting the next morning and then a day of interviewing candidates who were hoping to join The Pack, the 6000 strong volunteer workforce at the 2015 Rugby World Cup. This was my second stint of interviewing for The Pack having done some sessions at Leyton Orient in the summer (click here to read about it) and I was interested to see if the support team had managed to maintain their enthusiasm over six months of interviewing at 13 venues around the country. Although there had been a couple of changes of personnel they were as welcoming as they were all that time ago and knowing that this is the last venue and the busiest they have remained extremely professional. Over that day and the next I interviewed a dozen or so candidates and I was very impressed by the quality of the people who want to be involved in what is the third biggest sporting event in the world. 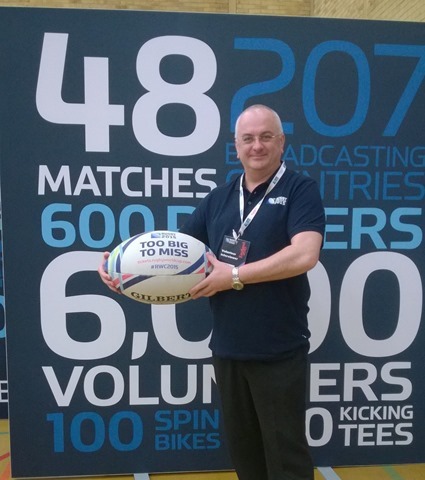 As before, there was a mixture of long-term rugby volunteers and those who had caught the volunteering bug at the London 2012 Olympics. But there were also some who live near the stadium wanting to be a part of the tournament taking place in their community. There were couple of other meetings to attend at the RFU and then it was game day. I had a number of guests coming from Eastern Counties clubs but I was looking forward to meeting someone who has become part of Twickenham’s folklore. 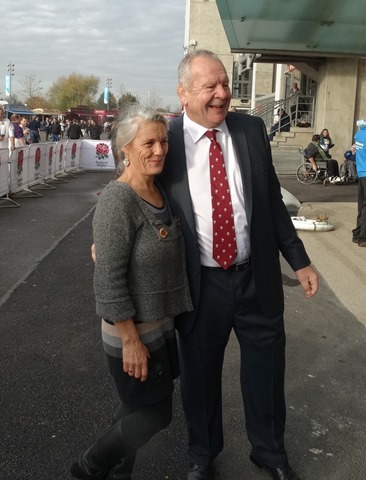 Nina Roe, a player at Southwold Swallows, contacted me on behalf of her cousin Erika Roe who wanted to meet Bill Beaumont before the game and promote a calendar for Against Breast Cancer. Bill was England captain against Australia on that infamous day when Erika displayed her ample charms on the pitch during half time, but he was too engrossed in his team talk to realise what was happening. I contacted Bill and he duly met Erika for the first time and I was lucky enough to spend some time with her too. The atmosphere in the stadium before kick-off was excellent with an expectant buzz from both sets of supporters and the anthem sung without accompaniment was the best I had heard. A minute of applause celebrating Phil Hughes’ tragically short life was a moving tribute, emotional for everyone. Although England dominated the set piece I was staggered to read this morning that they had only a third of possession during the game which demonstrates what a defensive effort they had put up. Brad Barritt in particular was very solid and his blood-spattered shirt at the end showed how committed he had been. I thought that it was significant that in the last fifteen minutes of the game the English pack was destroying the Australian scrum with what is arguably a third choice front row. That evening there was a black tie dinner where volunteers from all over the country were being recognised, in the case of Eastern Counties it was Alan Murray from Hadleigh and John Langford from West Norfolk. By coincidence the Schools Body’s guests were John Roberts from Colchester and Steve Haycock from Mersea Island, both of whom I have known for something like twenty years, so our area was very well represented. The dinner was a chance to catch up with friends old and new, and I was delighted to see Pepsi and Gautam of the Indian Rugby team, over here as guests of Alex Murphy and who had looked after us so well during the recent tour of Delhi and Mumbai, and John Raywood with whom I toured to South Africa and New Zealand and who was now President of Surrey Rugby Union. The England players were all there but only half of the Australian team attended as they were getting ready to fly home after a long and tiring tour of Europe that started with a game against the Barbarians a month ago. But all the players were happy to talk and sign autographs now that the international season is over, at least until England play Wales in Cardiff on Friday 6 February in the first game of the 2015 Six Nations.